If you are looking to experience an amazing vacation, unique culture and tropical weather while staying in the United States, you should consider visiting Hawaii. Located on the island of Oahu, Honolulu is the largest and capital city of Hawaii. With a population of over one million people, Honolulu is a perfect place to relax and also experience the unique culture of the Hawaiians. Honolulu, which means “protected bay” or “sheltered harbor”, in Hawaiian is believed to have been founded over two thousand years ago. This city is considered one of the safest in all of America with several unique features, diverse population, tropical climate, magnificent landscape and pleasant atmosphere. Honolulu is home to the only royal palace in America. 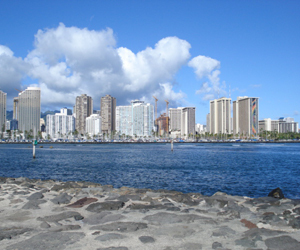 Majority of visitors travel into and out of Hawaii through this city. Search for cheap flights to Honolulu and travel to this amazing city. One of the major point of entry for the Hawaiian Islands is the Honolulu International Airport. Over 20 million travelers use the airport annually and served by over 27 air carriers. The Oversees Terminal is served by major American airlines and by many international airlines as well. Honolulu International Airport has three terminals. The main terminals accommodate all local and international flights; the interisland terminal is a separate building with close proximity to the main terminal and it offers flight to other Hawaiian Islands; and the commuter terminal accommodated smaller interisland air carriers. The terminals are located few distances away from each other, it is therefore advisable to use the free Wikiwiki Shuttle when going from one terminal to another. The airport is one of the busiest in the entire country, with flights to most major cities around the world. Transportation can be arranged for travelers through taxis, buses rental cars and shuttles. Located northwest of the central business district of Oahu, Honolulu International Airport serves as the major hub of Hawaiian Airlines. These airlines serves various parts of the Hawaiian Islands and also offers flights to Australia, Japan, Tahiti, South Korea and many more. Travelers can also get direct flights to several destinations on the Pacific Rim, American and Asian continent. Honolulu attracts millions of tourist from all around the world including Japan, the United Stated and Canada. Of all the islands in Hawaii, Honolulu is the most visited because of its white sand beaches, cultural events, lovely hotel accommodations and year round warm weather. Honolulu is a perfect vacation destination to tourists who wish to relax and enjoy memorable moments. All through the year, Honolulu is sunny and warm, with an average temperature of 80 degrees. For those who want to enjoy splendid and fun filled moments, the best time of visiting this beautiful city is during summer. During this period, Honolulu attracts hundreds of thousands of visitors, families and honeymooners to enjoy their holidays. Hotels, beaches and several activities tend to get busy during the summer holiday. This is also the best time to enjoy several water sports on the beaches including surfing, diving, swimming and much more. Look for cheap domestic flights. cheap flights to Honolulu and travel to this amazing city. Mobissimo has multiple ways to help travelers find cheap flights to Honolulu. You can subscribe to our weekly cheap flights and deals newsletter which includes great deals on cheap flights. We provide an Airfare Index that you can subscribe to on our front page which will alert you to the cheapest flights to Honolulu via RSS. When your search on Mobissimo is finished we provide a recommendation box with dates when the flight to Honolulu is the cheapest. There's our Facebook page where you can connect to people who are looking for great deals to Honolulu and where we also post cheap flight deals regularly. Our blog provides highlights of sales on flights on major carriers. We also have a flights deals page that is updated daily. If you're looking for cheap domestic and international flights to Honolulu, USA , it helps to be flexible with your travel dates. Being able to leave on a Thursday or come back on Monday, and taking early morning flights, will help you find cheaper flights than the busy and popular early evening flights and late afternoon flights for Honolulu. Searching during the travel off season for Honolulu will also help you find the best fares. Keep in mind to search for the cheapest flights to nearby cities airports. Mobissimo is the ultimate travel search engine for all USA destinations.